KidStart Magazine > Lifestyle > Reviews > The GLTC Name Label Guide. It’s the end of the school year and you have asked the kids to bring home all their kit and uniform for a good wash for over the holidays. Somehow though you end up with one plimsoll missing from the PE Kit or maybe the Kit doesn’t even make it back, plus you have half as many lunch boxes than you had at the start of the year. So the Great Little Trading Company have taken on the mission of missing stuff and produced our own extensive range of name labels. The range covers all shapes and sizes and you have the choice of adhesive, sew-in and iron-on dependent upon what you need. We understand how overwhelming it can be trying to choose the right name labels, so we have pulled together a guide on how best to use the variations and also how to apply them. 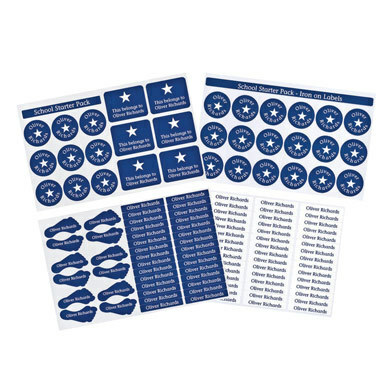 Step 1: Choose your attachment Adhesive If you need something quick and easy then adhesive will be the best option for you; just wash and dry the area you are attaching the label to, peel off a sticker and then apply. For best results though we recommend you allow 24 hours for the sticker application before use. Adhesive Labels are perfect for lunch boxes, drinks bottles, shoes and cutlery which means they can withstand a wash as well. Iron-On If you are looking to label some clothing that doesn’t involve a needle and thread, then iron-on is a great solution. It’s simple just follow these steps: 1- Wash all new clothing before applying the name labels 2- Pre-heat the iron on the cotton without letting it steam. 3- Peel the label off and place it onto a clean, dry garment. 4- Then get the blue application paper and apply, press the iron on it for 15-20 seconds. 5- Repeat this process 2-3 times applying pressure with the iron on all edges and corners. 6- Check if the label can be lifted and if so re-apply the steps for a bit longer. Iron-on is great for school uniforms, PE Kits or bags and much quicker than sewing. Sew-In Sew-in labels offer that little bit more durability; it’s the strongest method of attachment to ensure that the labels really won’t get brushed off. You just need a needle and thread and a good sturdy hand. GLTC have worked with Cash’s woven name tags to develop an exclusive range of child friendly designs to ensure there’s a variety of colours and motifs to choose from. 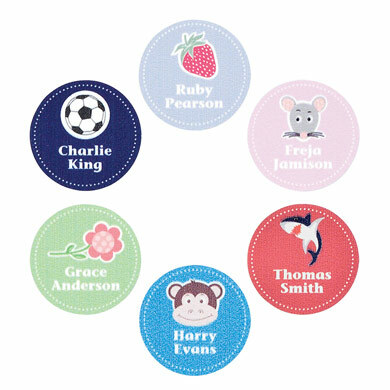 Step 2: Choose your design The GLTC Top Pick The GLTC Super Duper Round Name Labels are a bit special as you can choose a unique picture to fit under their name, from Monkey to Football, Flower, Strawberry, Shark or Mouse. 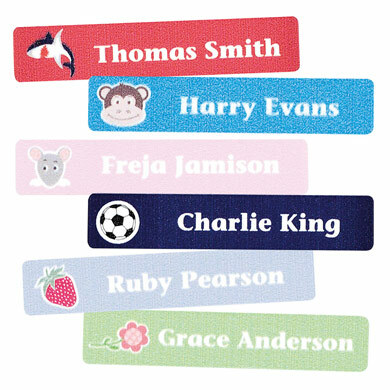 You can then personalise the name label with their name. These are available in both adhesive and iron-on as well as round and rectangular. However if you have lots to do and want the choice then try our Super Duper Combo Pack which gives you the choice of backing and shape. Left & Right Shoe Labels A really quirky option for shoes is the GLTC Left & Right Shoe Labels which are shaped like feet! These are great for school shoes, plimsolls or trainers, so they can just peer inside and see if it’s theirs. If applying a label to a shoe we recommend you apply the sticker to the inside of the shoe and cover with a clear shoe label to prevent fading and moving around. One name and design per pack. It’s great if you have a lot to label and can’t decide what to go for. Step 3: Get them personalised Now for the final step which is the most fun. You’ve chosen which type and design you want, so it’s time to pick a motif and then personalise the label with their name. The personalisation can take up to 17 characters but no accented letters. As we understand you want to get these as soon as possible to ensure you are all prepared we turn them around at a high speed. This means that we can’t accept cancellations after 24 hours of placing the order. 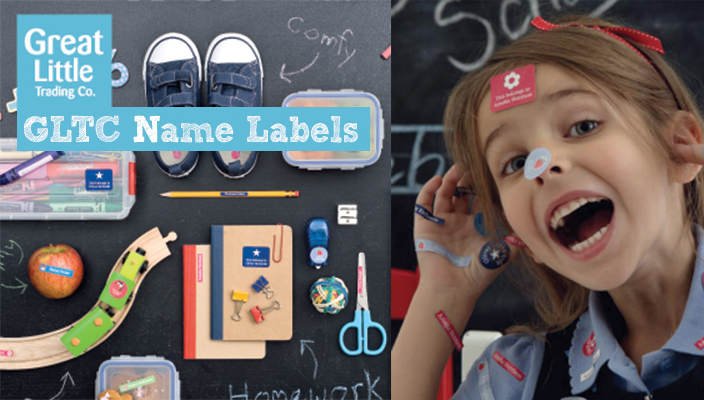 Get your GLTC Name Labels ready and shop through KidStart to get 7.5% KidStart Savings!